The PowerDsine 3504G offers a cost effective, fully IEEE 802.3af compliant solution to upgrade existing infrastructures with PoE, providing a maximum of 15.4 watts of power through each port and ensuring safe operation of any standard PoE data terminal. 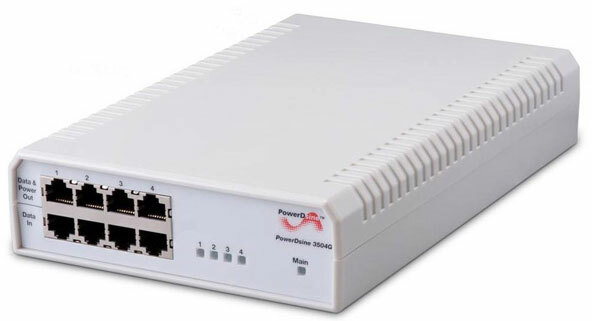 The PowerDsine 3504G provides PoE to IP telephones, wireless LAN access points, security network cameras and IP terminals to receive power, along with data, over standard Ethernet cables, leaving network infrastructure completely unaltered. With the midspan"s plug-and-play installation, they are easily and cost effectively implemented leveraging an existing Ethernet infrastructure while at the same time providing the assurance of a future proof network. The PowerDsine PD-3504G/AC is also known as PDS-PD3504GAC	or PD3504GAC	.